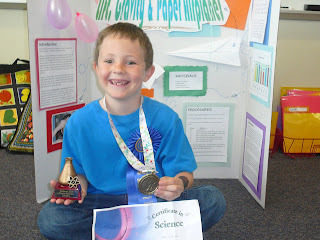 these past two weeks were the archuleta and denver northeast science fairs. sam's kindergarten class and adam entered projects. and both won grandprize(1st) at archuleta's fair. there was one winner per grade. so both got to go to the regional (denver northeast) fair. there adam took 1st place! sam's class received 3rd place! we were very proud of all the hard work these two boys put into their projects. adam learned about lift and gravity and paper airplanes. sam learned about growing crystals. both knew their stuff. we may never have any sports trophys, but we've got one with a beaker and an atom. we rock! please see sam's picture next week since i didn't have his board for him to pose in front of.